Palermo passenger and car ferry ticket prices, timetables, ticket reservations and information for ferries sailing from Palermo to Civitavecchia, Genoa, Livorno, Malta, Napoli, Salerno and Tunis. Compare all available Palermo ferry ticket prices in real time and book the cheapest available Palermo car and passenger ferry tickets sailing to and from Palermo, Civitavecchia, Genoa, Livorno, Malta, Napoli, Salerno and Tunis with SNAV, Grandi Navi Veloci, Tirrenia Ferries or Grimaldi Ferry Lines ferries online with instant confirmation. 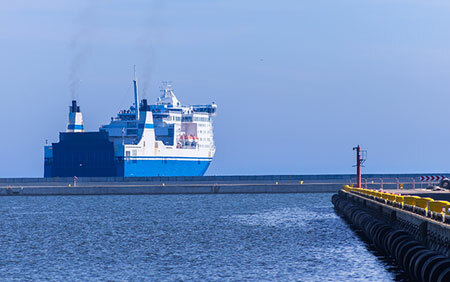 Book Palermo Ferry Tickets with SNAV, Grandi Navi Veloci, Tirrenia Ferries or Grimaldi Ferry Lines for ferries sailing from Palermo to Civitavecchia, Genoa, Livorno, Malta, Napoli, Salerno and Tunis online in advance to enjoy the cheapest available ferry ticket price. The price you see is the price you pay. There are no hidden extras or surprises such as added fuel surcharges or booking fees and we do not charge you anything extra for paying with a Visa Electron card. The price we quote you for your selected Palermo passenger or car ferry ticket, onboard accommodation and vehicle type is all you will pay, and that's a promise. To obtain a Palermo ferry ticket price and book your ferry ticket securely online please use the real time ferry booking form on the left. You are also able to add a hotel at your destination, or anywhere else, to your ferry ticket when completing your ferry ticket reservation. Palermo is a city of decay and of splendour and, provided you can handle its raw energy, deranged driving and chaos, it has plenty of appeal. Unlike Florence or Rome, many of the city’s treasures are hidden, rather than scrubbed up for endless streams of tourists. Be prepared to explore this giant treasure-trove of palaces, castles and churches has a unique architectural fusion of Byzantine, Arab, Norman, Renaissance and baroque gems. Palermitans themselves have inherited the intriguing looks and social rituals of their multicultural past. Life here is full on: a very public, warm-hearted and noisy affair. At one time an Arab emirate and seat of a Norman kingdom, Palermo became Europe’s grandest city in the 12th century but, in recent years, its fame (or notoriety) has originated mainly from headline-grabbing assassinations and political corruption. The Mafia still maintains a stranglehold on the city; many of the judges require 24-hour police surveillance and protection payoffs remain commonplace. While some of the crumbling palazzi bombed in WWII are being restored, others remain dilapidated; turned into shabby apartments, the faded glory of their ornate façades is just visible behind strings of brightly coloured washing. The evocative history of the city remains very much part of the daily life of its inhabitants, and the dusty web of backstreet markets in the old quarter has a tangible Middle Eastern feel. The flip side is the modern city, a mere 15-minute stroll away, parts of which could be neatly jigsawed and slotted into Paris with their grid system of wide avenues lined by seductive shops and handsome 19th-century apartments. Its ancient and medieval historical district is larger than that of any other Italian city except Rome and maybe Naples. Southern Italy's entire historical legacy exists along a kilometer of Corso Calatafimi --a Phoenician-Carthaginian cemetery, Roman homes (in Piazza Vittoria), Norman palaces (the Cuba and Royal Palace) and Baroque churches. Perhaps no other street in Europe boasts a heritage so ancient and so varied. Best Price Guarantee - We always offer you our lowest available SNAV, Grandi Navi Veloci, Tirrenia Ferries or Grimaldi Ferry Lines passenger and car ferries ticket price to and from Palermo. There are no hidden extras or surprises such as added fuel surcharges or booking fees and we also we do not charge you anything extra for paying with a Visa Electron card. The price we quote for your selected Palermo ferry ticket, onboard accommodation and vehicle type is all you will pay, and that's a promise! In the unlikely event you find the same all inclusive Palermo ferry ticket cheaper in the brochure of any other tour operator we promise that we will do our best to beat that price or offer you the choice of requesting a refund. To book Palermo car and passenger ferry tickets please click here. At ferryto.com you are able to obtain live Palermo ferry ticket prices, check availability and book car and passenger ferry tickets to and from Palermo at our lowest available ticket price. Ferryto.com is part of the world's largest online ferry ticket distribution network providing the ability to book over 80 major European ferry operators including to Palermo and to over 1,200 other ferry routes throughout the UK, France, Spain, Ireland, Holland, Eastern Europe, the Mediterranean, the Baltic and North Africa.